I am sure that there are quite a number of reviews that share my initial thoughts about In the Shadow of the Storm. 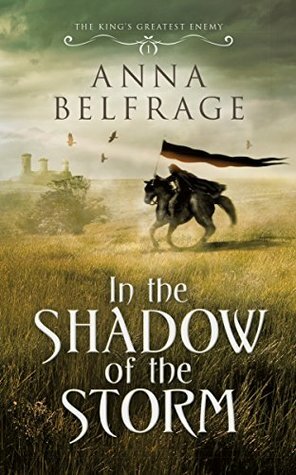 As big fans of the Graham Saga and Anna Belfrage we awaited this new book with both eager anticipation and that little bit of trepidation. Can she create another couple to replace, no replace is the wrong word because you can't replace Alex and Matthew. But can she create this new couple, Kit and Adam, with their own unique personalities and traits? The answer of course is a resounding yes! Right from the first page Anna grabbed my attention and kept it throughout. Women from the 1300's were political pawns and you married who you were told to marry, but in Kit's situation it was totally different (see synopsis above). The author made me care for her right from the first page. Though Kit and Adam are fictional characters, Roger Mortimer, Despener and King Edward II are real as are events that take place. The depth of research the author has done is evident here, it wasn't hard to visualize not just what was taking place but also feel the emotional vibes as well. There are scenes of violence (nothing too graphic, but enough to get the picture) that totally reflect the time period and there are scenes of love (this is Anna Belfrage here, she knows how to write them). Of course the authors writing style was smooth and it wasn't hard to get lost in this book. All in all a great start to a new series, one of which I anxiously await book #2.